In mid-August, the Bureau of Land Management held an auction for some of the most worthless looking land in the U.S. -- parched stretches of Nevada where tumbleweeds are the tallest plants and rugged acreage in California suitable for goat herding. Yet in two hours, the auction raked in $20 million, often attracting $500 an acre -- and, in one case, $14,000 an acre -- for tracts that might have once fetched only a few dollars an acre. The frenzied bidding reflected the fact that the BLM wasn't selling the land itself but was offering leases for what lies beneath: heat. A rush to lock up these rights is evidence of exploding interest in geothermal energy, one of the greenest of green power sources. The little-utilized energy source involves drilling holes with rigs like those used by the oil and gas industry and drawing water and steam from deep within the earth. 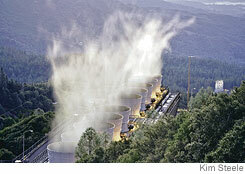 The heat from the hot fluids or steam is used for power generation or heating purposes. Cooled fluids are piped back to injection wells where they're returned to the earth for another round of heat extraction. This type of power generation has been around a long time -- Prince Piero Ginori Conti put the first geothermal plant into operation in northern Italy in 1904. While it gains momentum during periods when conventional fuels are costly, interest typically fades when prices retreat. Now, rising costs for conventional power plants and pressure to cut back on greenhouse-gas emissions have once again stoked the appetite for geothermal projects in the U.S. Twenty-five states have ordered utilities within their boundaries to add more renewable energy to their portfolios and this demand, backed by a federal tax credit, has spawned plans for 74 projects, most in Western states, that could double the installed geothermal capacity in the U.S. in coming years. That explains the land-rush mentality that has developed among power generators. In addition to the August auction, the BLM collected $9.3 million for geothermal leases in Idaho and Utah earlier this year. If most current projects pan out, geothermal electricity production could double to 10% of power generation in California and perhaps 15% in Nevada. Like solar panels and wind turbines, geothermal plants harness a natural energy source to obtain heat as an alternative to making heat by burning fossil fuels. It has been developed in many nations, especially those lying within the "ring of fire" of active volcanoes that circles the Pacific Ocean where hot rock is close to the surface. People once looked for surface manifestations, like steam vents and geysers, but now use geologic heat-flow maps since there are many good areas with no tell-tale signs. The best natural resource in the U.S. is in the West, for example, where tectonic plates rub, but there are promising pockets in the East where heat is found at drillable depths. Heat fields can be productive for decades, if properly managed. Typically, the best sites for geothermal energy are where hot rocks are relatively close to the surface and laced with cracks through which water can flow. Calpine Corp., San Jose, Calif., the nation's largest producer of geothermal power, has seen the value of its holdings nearly triple since 2005, by some estimates, at "The Geysers" in Northern California, a site that has proved to be the most fertile steam source in the continental U.S.
Other companies are speculating on projects that could target specific needs -- like a pair of Nevada real-estate developers who want to generate geothermal energy to warm warehouses and housing developments they are planning in the Nevada desert. By some estimates, the U.S. has the world's greatest geothermal potential. A recent study by the Massachusetts Institute of Technology concluded that as much as 100,000 megawatts of power generation -- equivalent to the entire U.S. nuclear fleet -- could be culled from geothermal resources by 2050. Of course, even if all the currently planned projects get built, geothermal would amount to only about 1% of total power generation in the U.S., versus 0.35% in 2005. And it remains a tricky resource. Since geothermal plants are small, it takes lots of them to make a dent in energy demand. It also requires expensive drilling, expertise in geology and hydrology, and specialized equipment. Maintaining wells is expensive and steam can't be transported long distances because the heat dissipates. Still, the environmental impact is modest compared with other forms of power generation and geothermal plants produce steady electricity. Part of the increased interest in geothermal energy is being spurred by an agency that formerly was seen as an impediment. The BLM is in a pivotal position because the federal government is the biggest landowner in the West. In the past, it mostly leased land for nominal sums to those that sought leases and collected royalty payments following development. But under the Energy Policy Act of 2005, the BLM must conduct regular auctions. The U.S. Geological Survey is doing a resource assessment, the first since 1979, due out next year. Congress is mulling legislation that would encourage more geothermal research and energy production, encouraged by new processes that allow lower temperature resources to be developed profitably. "It's a real shake-up and it's bringing lots of new people into the industry," says Karl Gawell, executive director of the Geothermal Energy Association in Washington. He says his trade group held an investor conference in May that was so well-attended "we had to move the meeting room to larger spaces three times." The biggest buyer at the Reno auction was Ormat Technologies Inc., founded 42 years ago by a husband-and-wife team, Dita and Lucien Bronicki, which has built enough capacity in Nevada to meet the needs of 140,000 Reno homes. Ormat, which already had 200,000 leased acres in the U.S., added an additional 68,900 acres at the most recent Reno auction, spending about $8.2 million. Industry growth is "the most aggressive we've seen in 25 years," says Louis Capuano Jr., chief executive of ThermaSource LLC, a Santa Rosa, Calif., geothermal-services firm that's drilling wells in California and Nevada. He's negotiating to buy his sixth drilling rig. The Bottle Rock plant that was built by the state of California in 1985, gives a sense of the ups and downs of geothermal development toward the end of the last boom. Although the Department of Water Resources built the plant, it relied on private companies for steam. At first, the plant ran like gangbusters, but by 1990 it no longer could get enough steam and it was mothballed. ThermaSource's Mr. Capuano says the state approached him in 1998 to see what he'd charge to tear it down. Mr. Capuano says, "I would have cried to destroy it." Instead, he and some partners bought it for $1.8 million and later sold a majority stake to U.S. Renewables Group LLC, a firm backed by private-equity interests Carlyle Group and Riverstone Holdings LLC. In March, the plant started up again, though without as much steam as needed. So when the BLM announced that one of the parcels it intended to auction in August was a 470-acre tract nearby, U.S. Renewables jumped. On the auction day, U.S. Renewables slugged it out with Calpine. There was a collective gasp when the price shot past $5,000 an acre and stunned silence when bidding crested at $14,000 an acre, a BLM record. "Sure, I paid more than $6 million for it, but I can be generating power from new wells there within two years," said Thomas P. King, a partner in U.S. Renewables Group. "What we're after is sustainability for Bottle Rock. Expanding the lease is incredibly valuable to us." 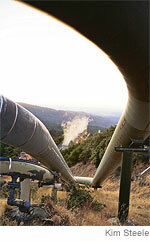 Some geothermal veterans think the BLM must move faster. Ron Barr, president of Earth Power Resources, a geothermal-development firm in Tulsa, Okla., says at the Reno auction, "I didn't know whether to bid or picket."